Fiat Currency in Circulation, How Much Money is There? There are several different monetary aggregates used to measure a nation's money supply. These monetary aggregates can be thought of as forming a continuum from most liquid (money as a means of exchange) to the least liquid (money as a store of value). 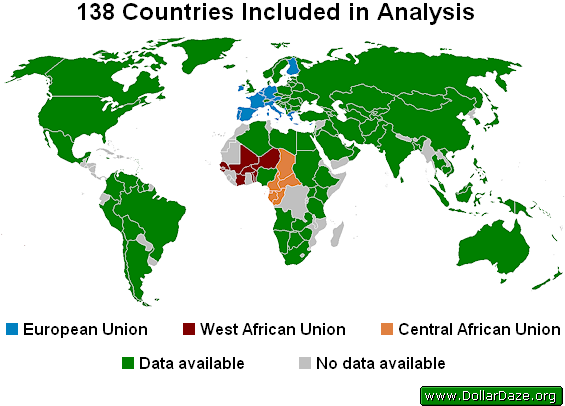 The following figure indicates compiled data for the most commonly used measures (M0, M1, M2 and M3) from 102 currencies representing 138 countries. Three of the five monetary unions can be clearly seen above. The remaining two are the IEOM which uses the French Pacific Franc in three member countries, and the East Caribbean Currency Union which uses the East Caribbean Dollar in eight member countries. The following graph shows the growth of money supply since 1971, a year selected for the reason that the last remaining currency to be convertible to gold, that being the US dollar, was made inconvertible on Aug 15, 1971. Four currencies (EUR, USD, JPY and CNY) comprise nearly 75% of all circulating banknotes and coins within the public domain. The following graph shows the historical outstanding stocks of M0 for currencies analysed in this essay. It is apparent that the quantities of money are increasing in an accelerating fashion. 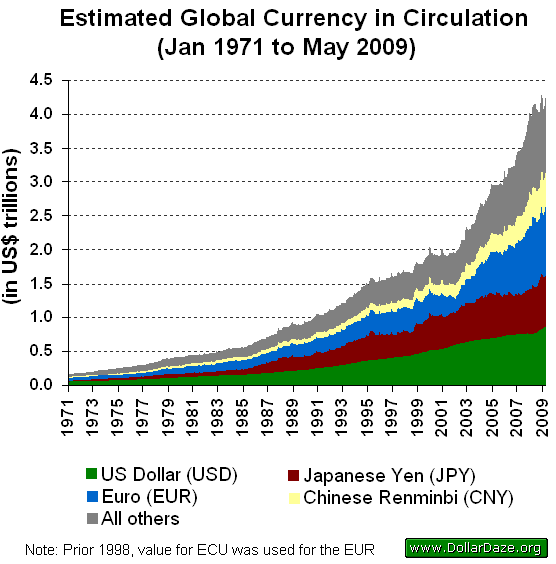 In 1990, the total amount of currency in circulation passed US$1 trillion. Twelve years later, the total amount exceeded US$2 trillion. This doubled again less than six years later in early 2008. The author is of the opinion that while we may likely experience a continual lowering of asset prices, the substantial increases to the money supply will lead to continuing higher prices for consumer goods. This may lead to a view that both inflation and deflation are occurring simultaneously, but when one applies the classical definition of inflation - that being an increase to the money supply - such apparent discrepancies disappear.